I was driving on the freeway in WA and my vehicle engine started to get hot. I turned off my air conditioner and was able to drive the short distance to my meeting and then found a shop in Gig Harbor. It turns out that my water pump was leaking. It cost me many hundreds of dollars to get it fixed. What could I have done to avoid this? Now there's no way for Gig Harbor drivers to predict when their water pump will fail – they just wear out. This fellow's water pump replacement was more expensive because his water pump is driven by his timing belt. That requires a lot of hours to get to the water pump and then put everything back on the engine. 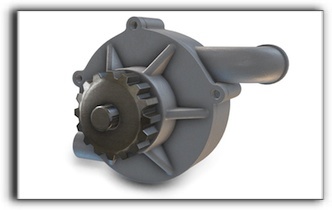 A money saving tip from Mackert Automotive in Gig Harbor: if your water pump is driven by your timing belt – replace the pump when you have your scheduled timing belt replacement. That way most of the work is already done and you don't have to pay for it twice. Check with your friendly and knowledgeable professionals at Mackert Automotive about when your timing belt should be replaced.